While I’m nowhere close to being a fan of the Transformers series, I’d occasionally watch the latest installment when it came to the cheap theater in town. I stopped doing this after the third film and only saw the fourth one on Redbox. I never even bothered with the most recent one. 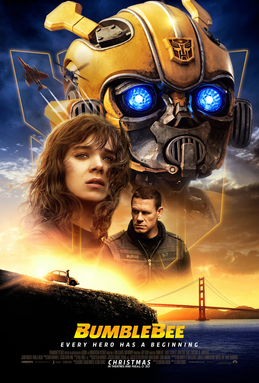 Then comes along this spinoff to the main storyline, Bumblebee (2018). For once, I was legitimately interested. The trailers made it seem like a cute little prequel/backstory for the practically mute robot in disguise. In the end, I was not disappointed, as Bumblebee was a fun and charming romp that showed what this franchise could have been like if Michael Bay didn’t direct. I appreciated how this movie essentially went full-in with its nostalgia. After all, since the Transformers originated in the 1980s, why couldn’t a film take advantage of this timeline to also reference lots of other 80s pop culture? Fortunately, it never went too over the top in these references but kept it to a nice gag every once in a while. It also didn’t take itself too seriously, which almost made it more like an homage to 80s films like Short Circuit (1986) and E.T. the Extra-Terrestrial (1982). This also probably helped make the action less nauseating and confusing, but I think this may have also been a factor of its director. Even though he’s only directed one other film before Bumblebee, I think Travis Knight is quickly becoming one of my favorite directors. After all, his only previous directing credit was for Kubo and the Two Strings (2016), and I adored that film. In the end, if you want an excellent 80s nostalgia trip, Bumblebee is the movie for you. You don’t even have to like Transformers for this film to be entertaining. If you’ve been turned off from this franchise before, I’d suggest forgetting that any of it ever happened and enjoy this film as your first foray into the realm of Transformers. A charming 80s nostalgia trip, I give Bumblebee 4.5 stars out of 5.